Bolland recognized the relationship between the Katwijk dialect and Old English. In 1879, G.J.P.J. Bolland (1854-1922), an assistant teacher at the Openbare School in Katwijk aan Zee, sent a list of linguistic observations to Leiden professor P.J. Cosijn (1840-1899) (LTK 1762: c). 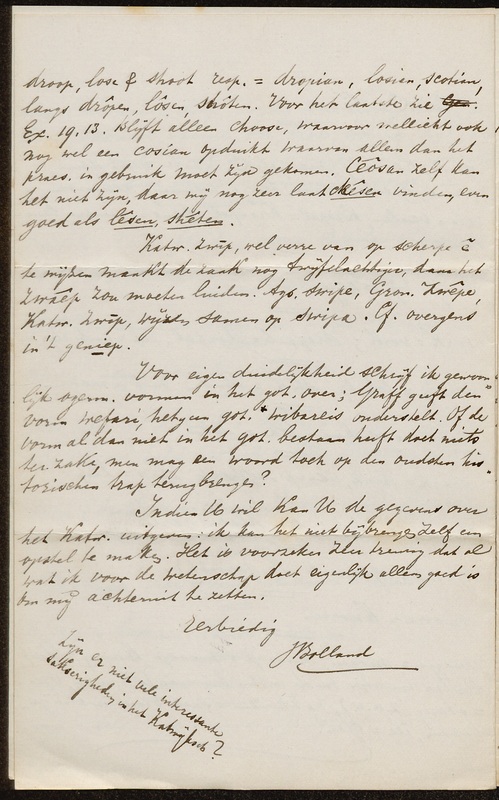 His observations provide a unique insight into the late-nineteenth century Katwijk dialect. Bolland’s letter largely consists of word lists in which the Katwijk pronunciation differs from that of Standard Dutch. His first observations relate in particular to the vowels, such as the list of words that makes clear that the inhabitants of Katwijk say ou where Dutch has oe before the consonants k, p, g and f: “boukwait”, “roupe”, “genouge” and “oufene” instead of boekweit ‘buckwheat’, roepen ‘call’, genoegen ‘pleasure’ and oefenen ‘practise’. In addition to the distinctive vowels, Bolland also reported on peculiar Katwijk pronunciations of words like “dekkeles” (for deksel ‘cover’), “eider-ende-iën” (for iedereen ‘everyone’) and “nelleboog” (for elleboog ‘elbow’). Bolland also listed some typical Katwijk words such as “garnt” (shrimp), “bennetje” (basket) and “bakkeràm” (a slice of bread fried in oil). Bolland closed his letter with the remark “Aren’t there many interesting Saxon-like things in the Katwijk dialect?”. This remark reveals the true reason why Bolland was interested in the Katwijk dialect: it bears some relationship to Old English or Anglo-Saxon. Bolland had studied this early medieval variant of English under the guidance of the Leiden professor Cosijn, to whom he sent his observations. Bolland’s interest in Old English and historical linguistics is well represented in the Special Collections of the Leiden University Library, which includes not only Bolland’s correspondence with Cosijn but also several textbooks with annotations in Bolland’s hand.